Yes, Lebron James and the Cavaliers are 21-4. True, the Lakers are 21-3 against a Western Conference that has turned into silly putty. However, those are not the, story in the first half of the 2008 NBA season. Oh no, that would belong to the 24-2, winners of 16 straight, defending champion, Boston Celtics. I thought they would have a bit of a championship hangover. Three veterans with alot of miles on their legs, just accomplished their career goal, what would they have left in the tank? Losing their playoff hero, James Posey, to the New Orleans Hornets in free agency. The Celtics had some question marks coming into the 2008 season. Consider those questions answered, and in the words of the immortal Jay-Z, "No one on the corner has swagger like us, swagger like us." The Boston Celtics are off and running towards Banner 18, and have become even better than the 2007-2008 version that trail blazed through the Lakers en route to their 17th World Championship. Among the top five players in scoring, assists, and field goal percentage, you won't find any Celtics. Among the top five players in rebounds, blocks, and steals, you won't find any Celtics. The Celtics aren't even among the top five in points scored as a team. Yet, the Boston Celtics still have the NBA's best record at 23-2. Surprise, surprise, the Celtics are doing it with the same defense that put them above the rest just a year ago. The Celtics are second in the league in lowest points allowed per game and they lead the league in opponents lowest field goal percentage. With Kevin Garnett averaging 16 points and nearly 10 boards a night, Ray Allen & Paul Pierce averaging nearly 19 points per game, and 3rd year guard Rajon Rondo going for 10 ppg and 7 assists, the Celtics are spreading it around. Of their 25 games, Paul Pierce has led the team in scoring just 11 times and Ray Allen led 9 other nights, the C's have 1st options, 2nd options, and 3rd options that can lead the team on any given night. The absence of James Posey may have left the Celtics without a three point and defensive force but the remainder of the bench has done very well. 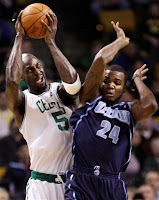 6th man, Leon Powe, has gone for double digits in points 8 times. Backup two guard, Eddie House has scored 10 or more 9 times, including hitting 33 from long distance. A healthy Tony Allen has shown flashes that he can bring more offense off the bench averaging 9 points a game. Between starters Kendrick Perkins (9 boards and 9 points a night) and Rajon Rondo doing what he's been able to, the Celtics have all five starters contributing on defense and offense. During last nights Hawks game, Perkins had a last second block of Joe Johnson and Rajon Rondo put up the assist that would lead to Garnett popping a blood vessel after a thunderous alley oop. The Celtics are currently 5-0 against teams they played in the 2008 playoffs, two against Detroit, two against Atlanta, and the opener against Cleveland. Do we still have any questions about this team? I think not. Come December 25th when L.A. plays host to these Celtics, it'll be a statement game for both teams and you can bet Garnett and Co. will be fired up and ready to play. "No one on the corner has swagger like us" is actually from the M.I.A song "Paper Planes". Then Jay-Z and Kanye took part in the remix. Just saying.